Believe it or not, I was actually looking forward to melting this fragrance, which is surprising considering Sugared Violet Petals is a solid floral scent. The difference though is the sugar component which I could clearly smell when I popped off the lid. Gentle floral notes of lilting peony with a heart of powdery violet meld beautifully to create a feminine scent that is the ideal balance of sweet and sophisticated. Sugar isn’t listed in the description but you can clearly smell that in this scent. Clearly, otherwise, I wouldn’t have cared for it. Violets are definitely NOT my cup of tea but blended with sugar… beautiful! That’s the best word to describe it. You can clearly smell the floral but blended with sugar tones it down and gives it a fresh vibe that’s really hard to describe. I love it. Now let’s see how it performs! I used the entire clamshell pack equally split between two electric melters. Once melting, it took a good ten minutes before I started noticing the fragrance and oh my goodness.., it was perfect. Could I smell violets? Yes but with the added sugar, in a good way. I don’t know how the sugar changes this scent but it does. It tones down the floral component so much, it hardly even smells floral if that makes any sense. Just imagine the dominating part of this scent as sugar. Sweet granulated sugar. Then add fresh but subtle violets in the background. The floral component is not strong, it’s instead a perfect counterpart to the sweetness that makes up this scent. It’s fresh and pretty strong. These melts filled my entire great room and then some with aroma. Which brings me to strength – on a scale of 1 to 10, I would rate these simmer snaps a 10 in any size room. This scent was a room filler. My guess is the candle would be strong as well but I won’t know until I try one. Which I plan to. I loved this fragrance. 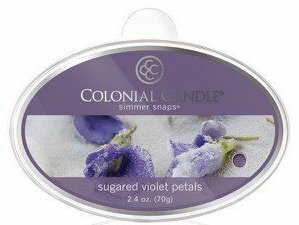 In closing, definitely give Sugared Violet Petals a try if you love fresh or floral scents. It’s a keeper.